FOX broadcasting, alongside Twitter and the ARF announced late-breaking mobile insights this week at the Re:Think conference in New York City. Twitter recently revealed the results of a survey on how connected Twitter and TV really are. The study found that 78% of earned audiences exposed to TV take action on Twitter and 77% take action to watch the show more. This means loyal audiences are following, retweeting, and engaging with their favourite shows both on and offline. But that’s not all. The social TV experience is quickly extending beyond simply trending due to the latest plot twist. Instead, traditional embedded marketing models are evolving to include social media, making it a lot easier for viewers to find and buy what they see on TV. Since audiences are already googling where to buy that handbag or sofa chair, it’s natural for brands to use social networks to bring their advertised products even closer to their consumers. Just think, every element of set design and wardrobe contains countless products that are being marketed to viewers, often without us even realizing it. Want your living room to mimic that mid century Don Draper office? 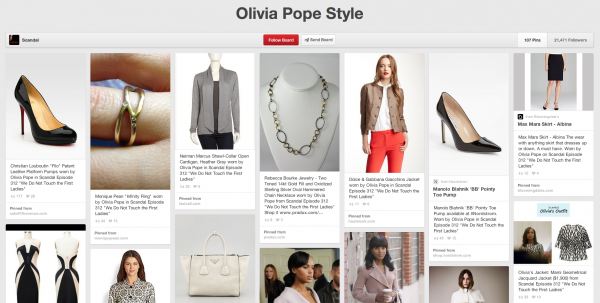 Fantasizing about marching into your next meeting with the powerhouse style of Olivia Pope? Try Pinterest. Brands are realizing that they can use social media to connect consumers with the products they already want. In the last year, the ABC network has taken charge of a new way of advertising during their primetime TV shows. The network actively updates their Pinterest boards to share the outfits and accessories for their lead characters, as well as a convenient link to where you can purchase. So for the 78% of TV watchers that are already on social media while they watch their favourite show, they are now instantly connected to the products on screen. It looks likes the future of embedded marketing could cut the overt logo closeups and verbal product plugs and get a lot more subtle. Will less intrusive product placement, with the help of a social second screen, make viewers more inclined to buy? Share your thoughts below! Make HootSuite your social second screen. Try it for free today!